Artists Luciano Castelli and Urs Lüthi were among the members of the commune, and figure prominently in the series. Portrait of Urs Lüthi (1970)—the earliest painting on view—shows Lüthi up close, wearing sunglasses indoors and looking wholly distracted or disaffected. In this and other images we find the “polyfocal” effect referred to in the exhibition title, for Gertsch retained the different degrees of focus brought by the mechanics of photographic reproduction (which are alluded to by the camera placed on a table behind Lüthi). Certain zones of the paintings crystallize into vivid focus, while others appear somewhat more blurred. At Luciano’s House (1973), a scene showing young women in a cluttered room, the curtain and floorboards are far crisper and clearer than the righthand figure’s fur collar, which slips into an almost painterly flourish toward the bottom. In a similar vein, Luciano I (1976) shows Castelli seated at a table strewn with dirty plates and glasses, all distinctly delineated, while an inexplicable blue splotch on the tablecloth directs attention to the brushstrokes apparent elsewhere. With the sitter’s sidelong glance and a door cracked open at left, Luciano I also hints at some sort of elliptical narrative, undermining the notion of cold, perfunctory documentation and evoking a vaguely anecdotal air. What, to take another instance, should we make of the butterfly that appears in At Luciano’s House? Is it perched on the room’s wall, or is it instead a fanciful element thrust into this otherwise ordinary scene? 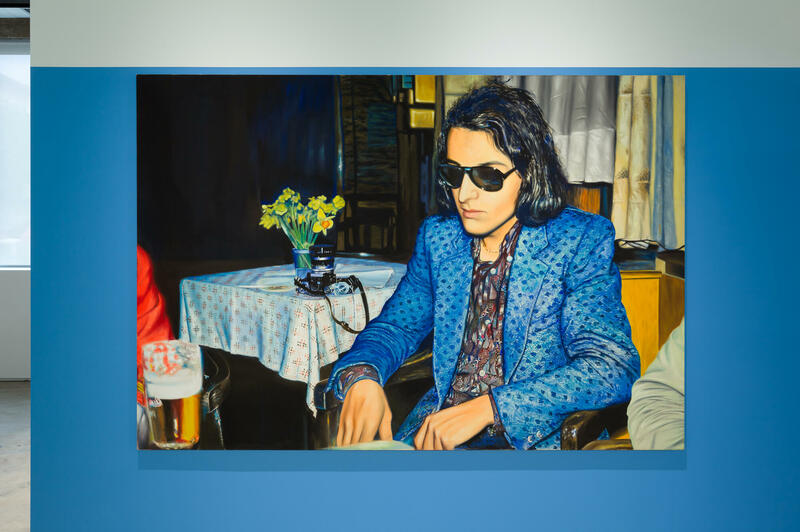 Perhaps more striking than the painting’s realism is the extent to which it—like Portrait of Urs Lüthi and Luciano I—anticipates the kind of imagery Nan Goldin would capture in the 1980s. Given Swiss bourgeois propriety, these individuals’ embrace of rock and roll, American-style dress, and play with gender roles was all the more transgressive. Indeed, Castelli, Lüthi, and their crew featured prominently in “Transformer: Aspects of Travesty,” a groundbreaking 1974 exhibition in Lucerne, curated by art historian Jean-Christophe Ammann, that explored the connections between cross-dressing in rock music and tendencies in contemporary art. Before taking up painting, Gertsch had created a number of children’s books. He conceived the stories—fairy tales featuring subjects ranging from a bear who wants to be a boy to a large walking teapot—himself, and produced spare woodcut prints to illustrate them, a few of which were on display here. Since then, Gertsch has made woodcuts employing his characteristically hefty scale. The exhibition included not only a handful of woodcut portraits of a woman named Natascha, but the massive plates involved in their making. Gertsch dyed one of the plates a silvery teal, so as to better conceive of how the excisions from the wood would translate into representations of light and shading. Another print, a 1991 example from a series called “Schwarzwasser” (Black Water), focuses on the whorls and ripples of a body of water. Given the image’s large scale and tight framing, the viewer is placed directly over the shimmering surface, which, displaying the same sort of dynamic seen in the paintings, flickers between realistic liquescent eddies and flecks of pure form.